We care for children from 3 months to 5 years of age. 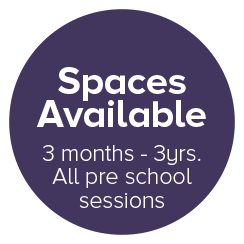 Newbury Gardens Day Nursery is a privately run, high quality, professional childcare service, catering in the main for working parents in the Newbury and surrounding areas. We care for children from 3 months to 5 years of age. We are open Monday – Friday throughout the year (except public and bank holidays). Full time places and part time places are available. Our opening hours are 8.00am – 6.00pm. The Nursery is based at Greenham House, which dates back to approx 1845. It is believed to initially be used as a school and over the years has seen several different uses including a family home, children’s clinic and a family centre. The surrounding grounds were cleared sometime during the 1920’s and became the beautiful Greenham Gardens, which the house backs on to, a place which we enjoy with the children. We provide a weekly session of Wiggle Waggle for all of the children. Wiggle Waggle is a seriously funky, upbeat and energetic music and movement programme for children from birth onwards. Children experience music from Riverdance to Trance, via Mozart and the Beach Boys…and everything in between. Children grow in confidence and skill, learn to share and take turns, to be bold and be still, get fitter, and sing in tune! We provide a weekly sports session for the children to interact and be active, whilst having fun as they learn different sports. Each week In2Sport teach children a variety of popular sports such as football, rugby and cricket. Our coach Dave has over 10 years’ experience of coaching and has a degree in sports science. All staff at the nursery are warm and welcoming. The nursery is extremely supportive of the needs of working parents and we always feel included. All staff have the children at the forefront of their minds and this has shown in the progress our child has made. A fabulous and caring environment that we are extremely pleased with. I was really pleased with what I thought was a very nice gradual settling in process, by going in at different times of the day, she was well prepared for the first day. The Key Person is amazing with our child, everyday we still feel that welcoming environment. We can see our child is extremely happy in the nursery and this is a huge comfort that we know she is in a safe place with lots of care. We are exceptionally happy with the standard of care, the staff, the surroundings and the way that our child has settled in. I wouldn’t hesitate to recommend the nursery to other families. Forbury Gardens Day Nursery was established in 1991 and is situated in Reading town centre, very close to the railway station. It was our first nursery to open, followed by Berkeley Gardens also in Reading, and lastly Newbury Gardens. We are proud to announce that Forbury’s latest Ofsted inspection in May 2015 was judged as “outstanding” in all areas. Waingels Gardens Day Nursery is our newest nursery, opening in April 2018. Set in Waingels College grounds, you will be able to find us in a spacious purpose built, one story building, with a large, secure outdoor play area. We will have ample parking for parents to drop off their child and a fabulous park on our door step to enjoy through out the summer. Please come and visit us to see what we can offer.